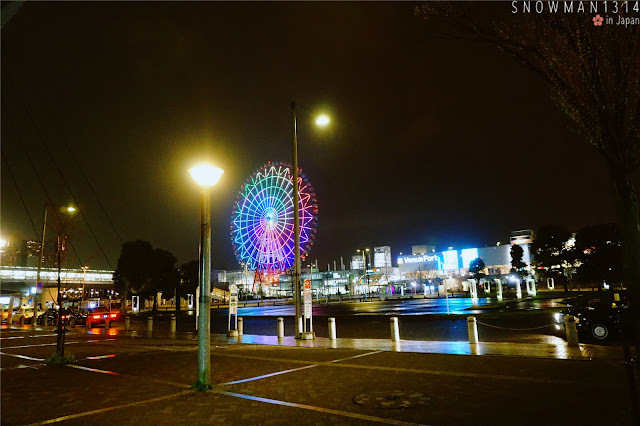 Gonna start my last post visit to Odaiba during my Day 4 journey at Tokyo! 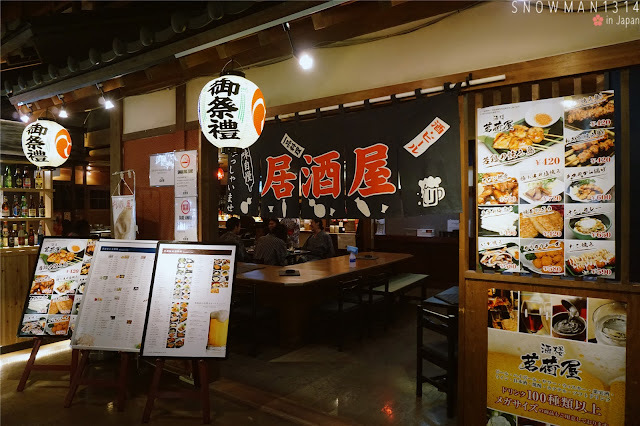 If you have read my previous post, you will know that I visit Tsukiji Fish Market here and Odaiba City here in the Day time when I am in Odaiba. 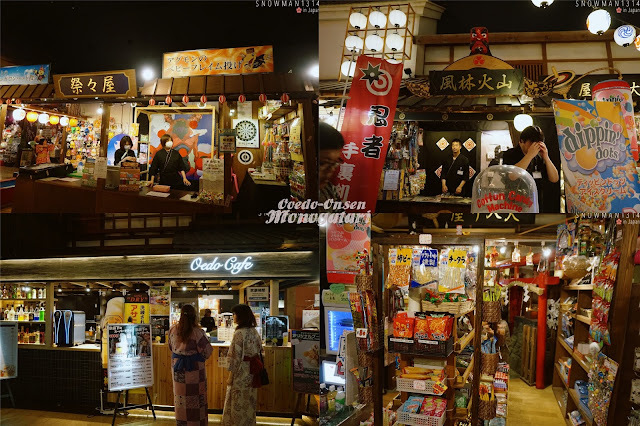 I manage to end my Day 4 visited Ooedo-Onsen Monogatari which will definitely be my unforgettable journey visit here. Want to know why I said that! Read more to know why! 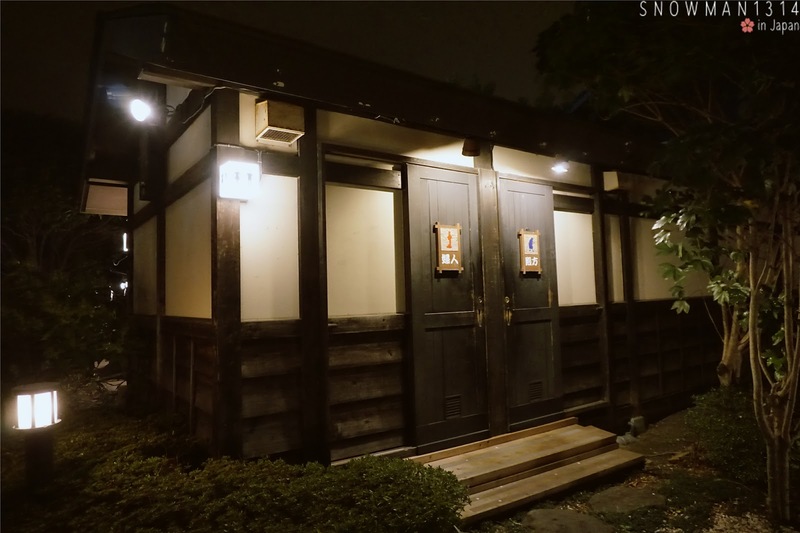 If you happen to visit here often, you will definitely understand what I mean. Night weather in Tokyo is definitely no joke, super cold and windy here. Since Odaiba is near to the sea, you can imagine the breeze of the sea blow on your face and body. My outfit reference links here for those who don't know what to wear in Tokyo during this Sakura Season. 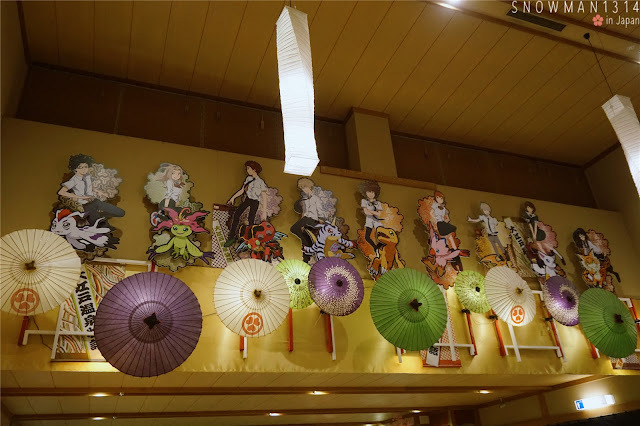 Guess what you see when you Ooedo-Onsen Monogatari!! It's Digimon everywhere!! So during my time visit to Ooedo-Onsen Monogatari, it was when Digimon has launched their Tri. 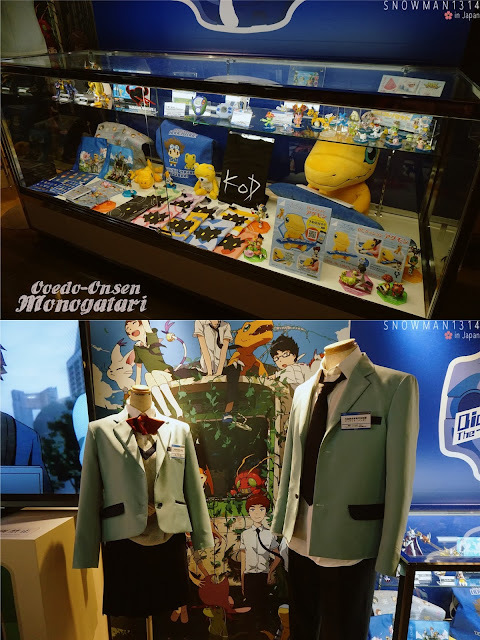 Digimon Series again. 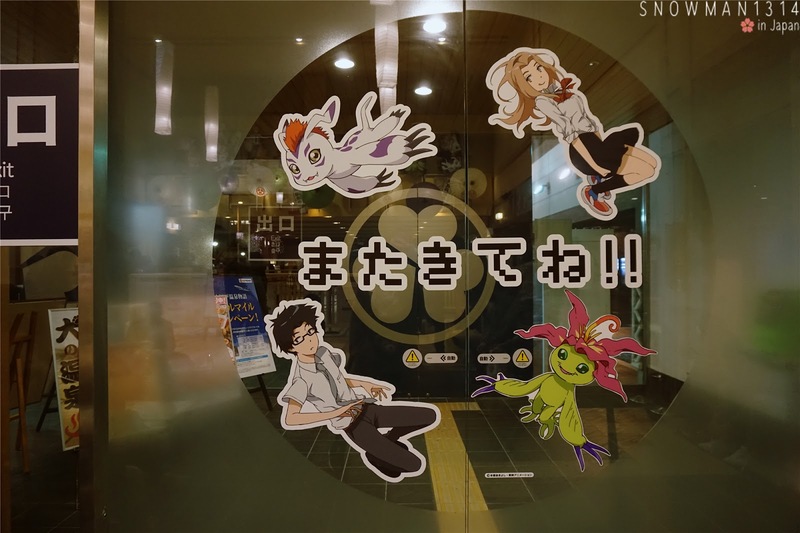 I feel myself consider lucky, Digimon too used to be my must watch childhood anime. See how pretty of all the latest Digimon animation are! I remember I watched their latest movie ep which they visit Ooedo-Onsen Monogatari in the episode itself. When I first research about this onsen, the information is not that informative so I did some mistake here and there. 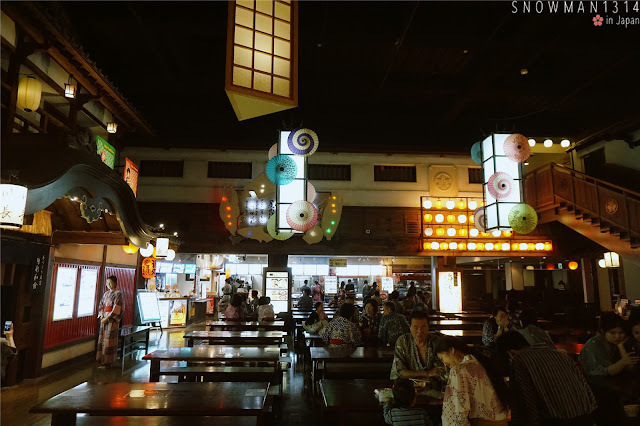 It was not too bad to try different things when you are travelling. Because nobody cares. Leaves your shoes on the locker and Please don't forget your locker number okay! 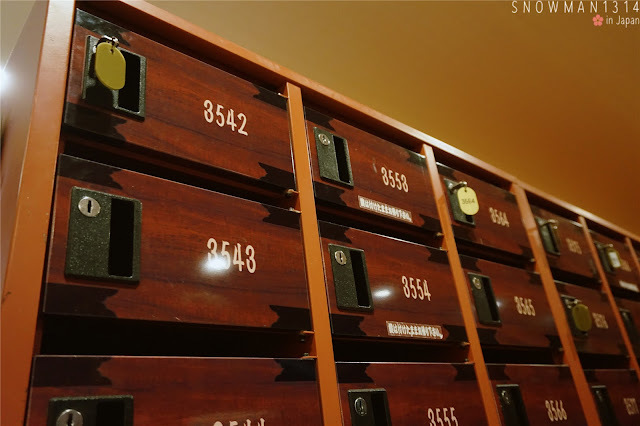 Because they have thousands of no of the locker. I remember there's some tourist actually forget their locker number. Without seeing or peeping through the locker, how the hell you gonna find your shoes when you forget your shoe locker no! 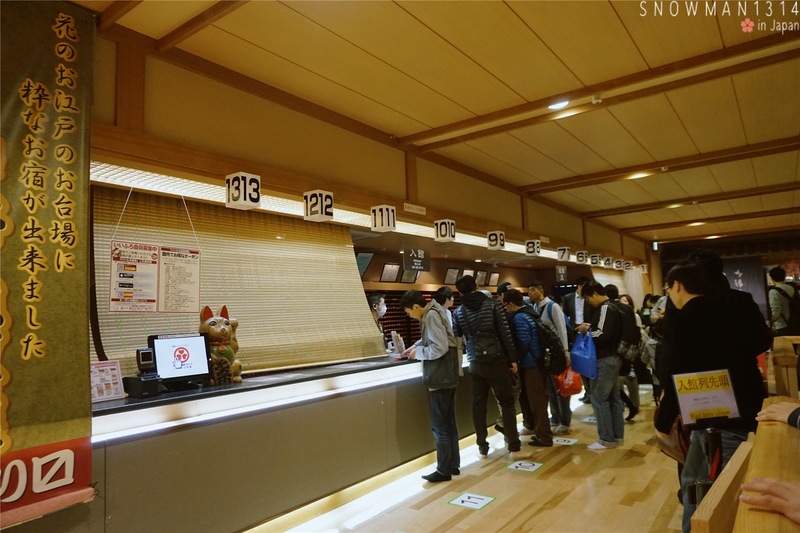 The counter where you get your tag before going in. The charge price entry to Ooedo-Onsen Monogatari. 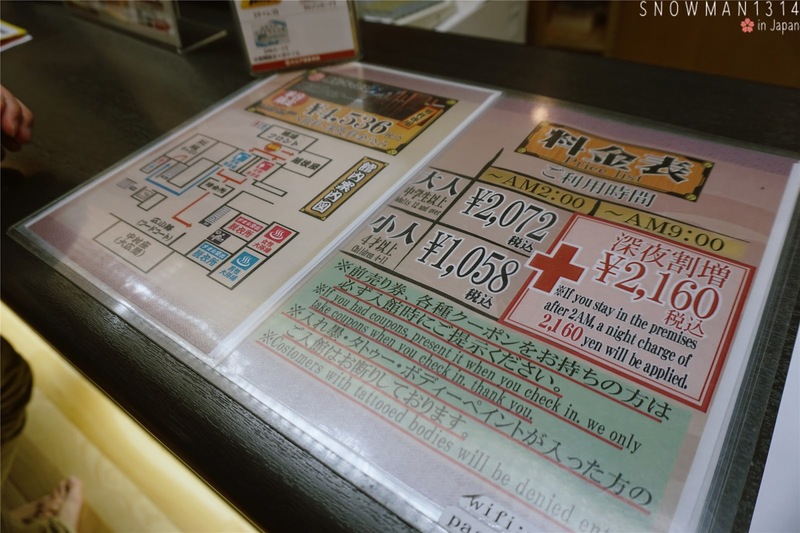 The money charge will be calculated when you exit the place. 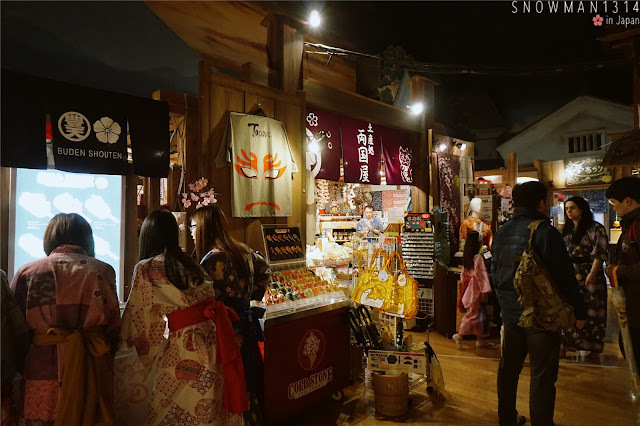 Here is where you choose your yukata to wear inside. They have few designs selection for Men and Women. Four design for men and five design for women in different sizes. Please pick nicely and choose your favorite one. Steps on how to wear Yukata. I bet everyone who never wears Yukata before will be curious how this outfit should wear. It was easier than I imagine! 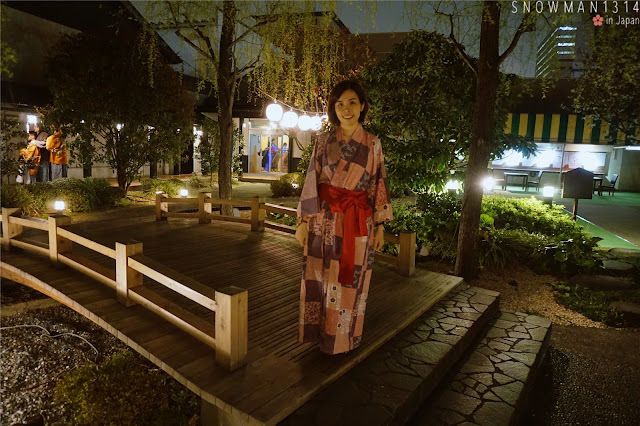 Since it was a yukata, the material was super light weight and easier to wear too. Entrance for Man and Woman. These are all the extra fee charges for you if you wanted to enjoy more spa and massage session inside Ooedo-Onsen Monogatari. 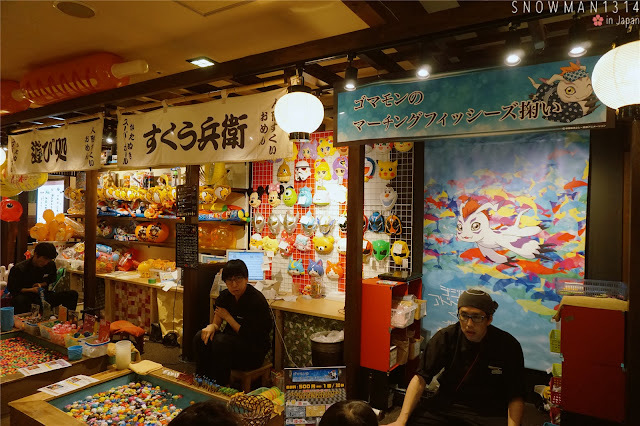 Activities you can do around the Ashiyu Area. 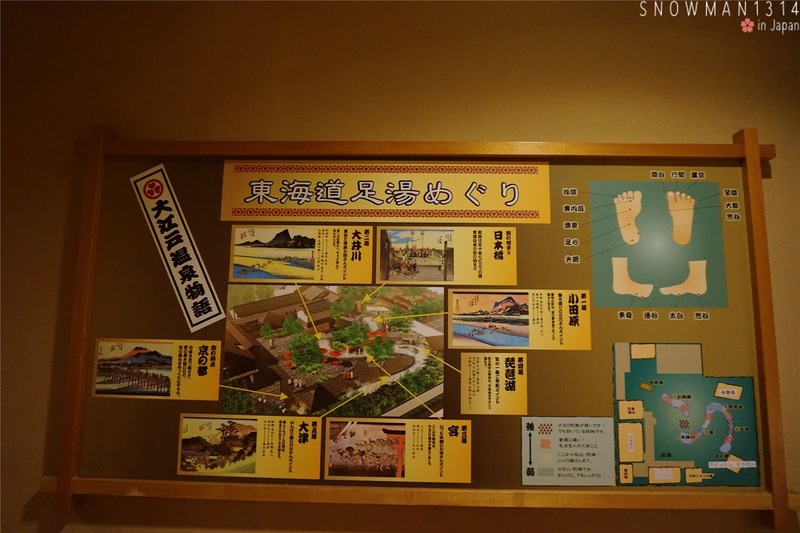 Map of the Ooedo-Onsen Monogatari. The real scenery you find in Tri. 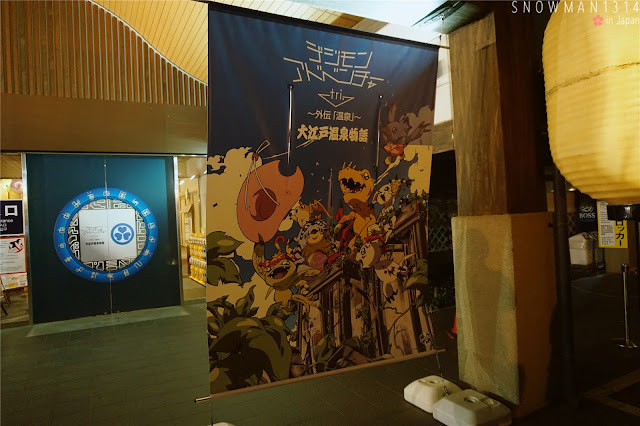 Digimon Episode. We start with the Foot Spa outdoor. Naked foot walking under the freezing weather is definitely not an exciting experience. 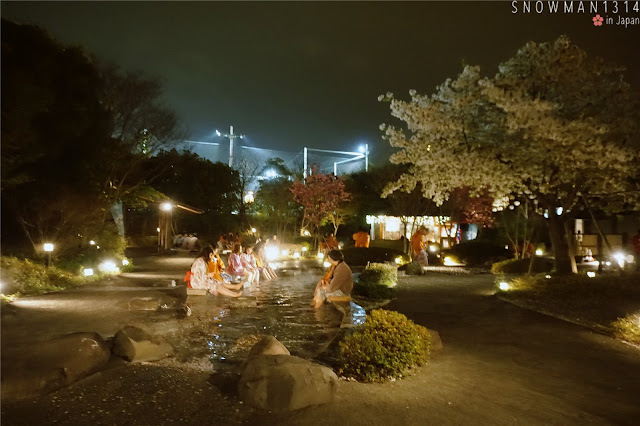 But it just feels so good after that you get to soak in their hot onsen outdoor. Don't forget the weather is freaking cold and wear a coat when you are heading outdoor. 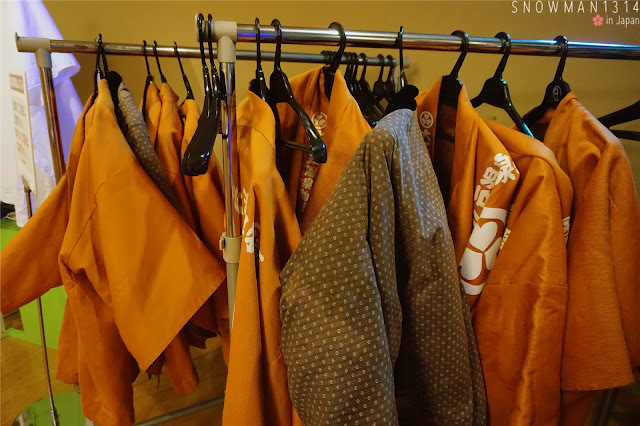 No worries the Coat is provided in Ooedo-Onsen Monogatari. Coat for you to choose to wear in the cold weather. 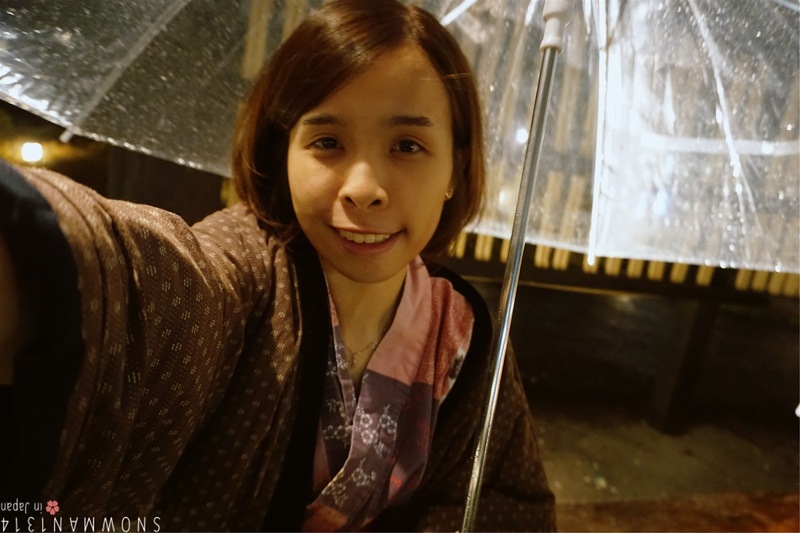 I went out to the Foot Spa for the second time under the rain while waiting my boy from the Public Onsen. 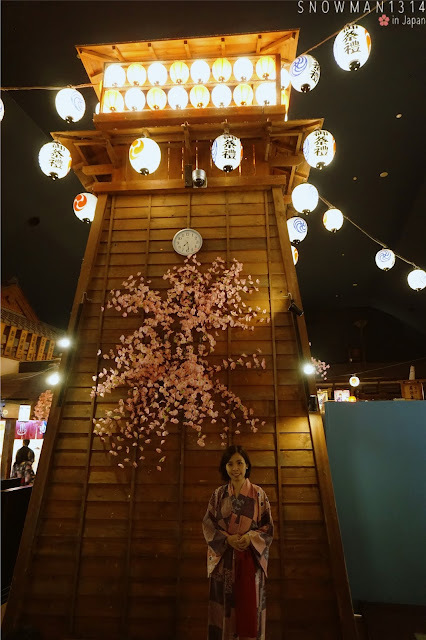 Me and Yukata. Since they have no more size S, and only M size left. 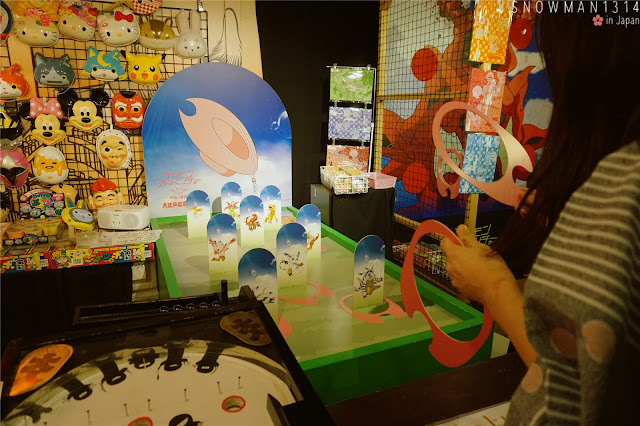 There has a game area too! The main decor in Ooedo-Onsen Monogatari. 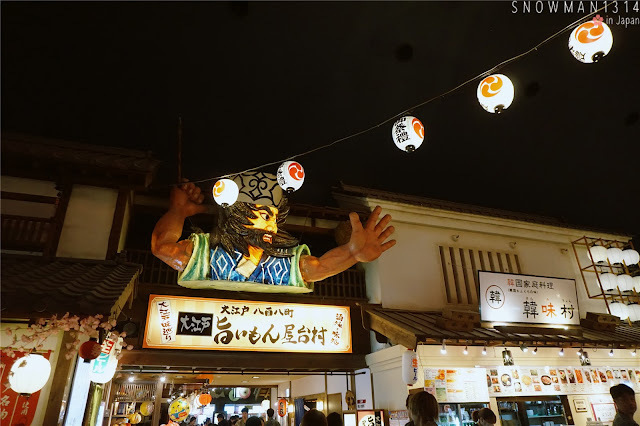 Looks like a summer night festival here too! 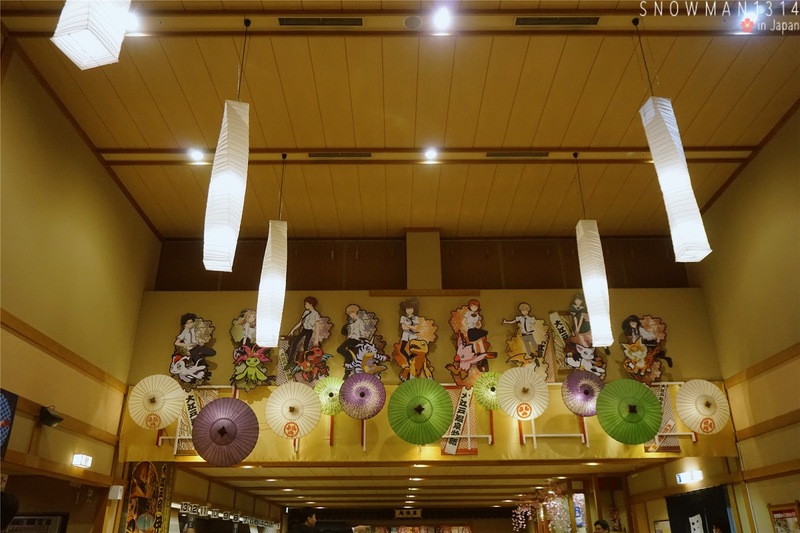 But is indoor with less crowded people and enjoyable spa and onsen here. Saw this super pretty Tri. 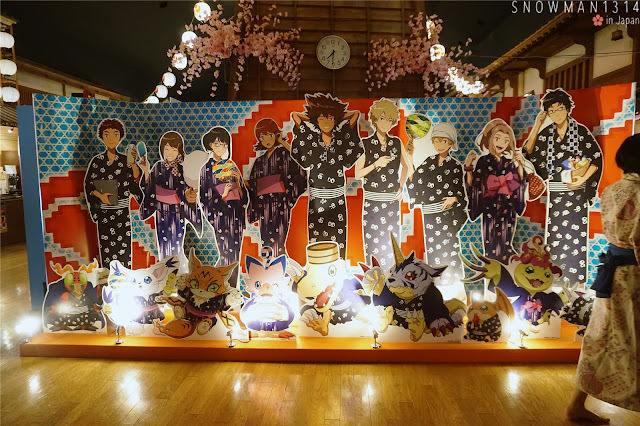 Digimon group photo! Must take a photo. This is where the interesting part comes! 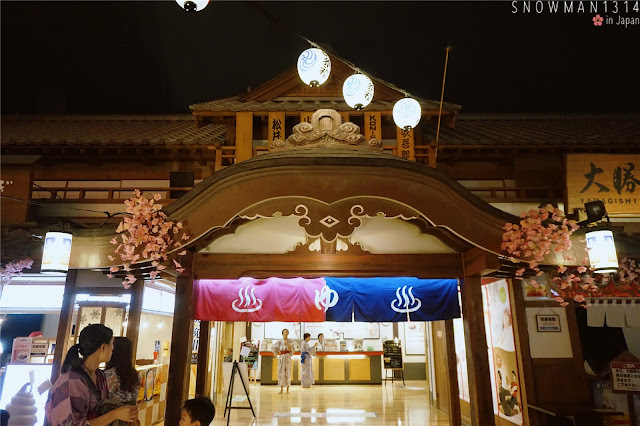 The big public onsen where everyone is naked while they enjoy onsen. 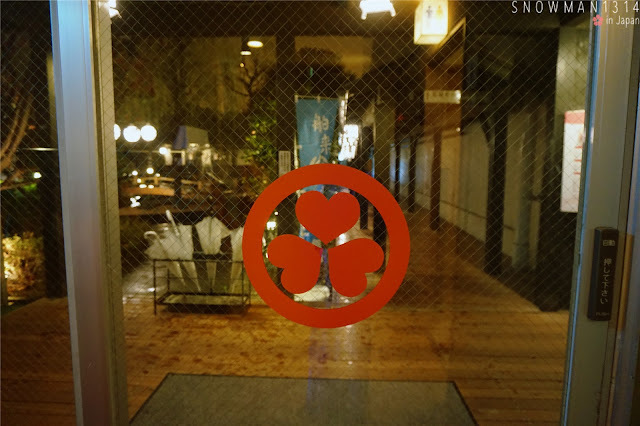 It was quite a tough decision for me to whether try their public onsen or not. 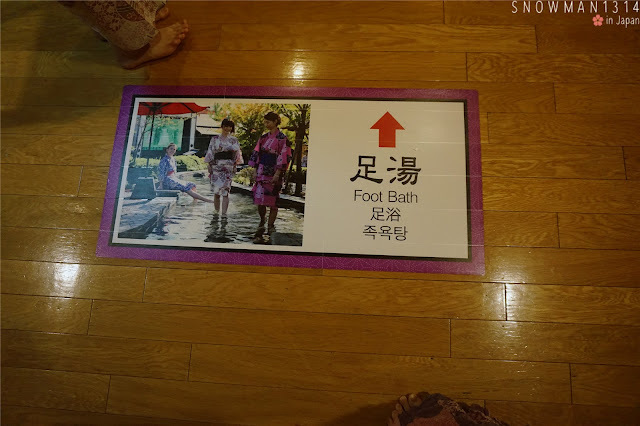 Since we have to be naked inside the onsen, and there is definitely nothing to really enjoy about if you see everyone naked and feeling awkward about it. 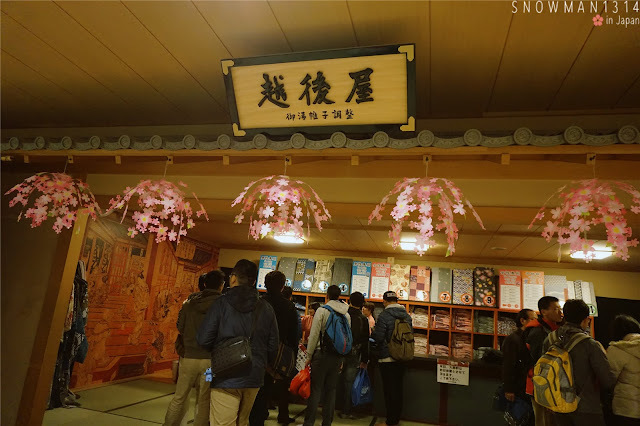 But since it was my first time inside the Public Onsen Naked, I did some wrong doing there inside the Onsen. So I would love to share my experience here! 1. They will provide you 2 towel and 1 locker to put your belongings. 2. Make sure to clean yourself. 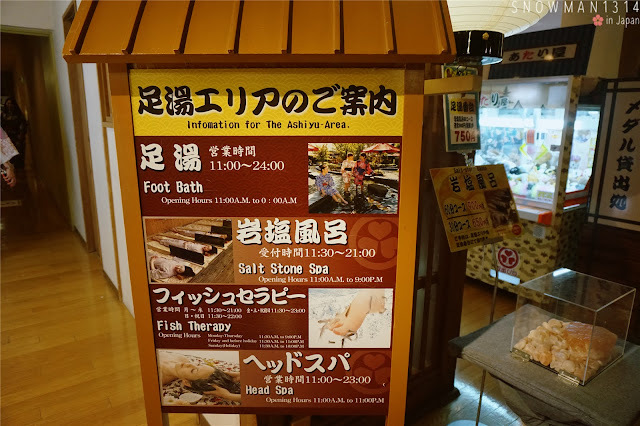 Take a bath, Cleanse your face and your body before entering any onsen inside. 3. Suggest to bring your own toiletries. They have provided toiletries too, including makeup remover aka face cleanser. If you don't mind, you can always just use theirs. 4. Please don't feel awkward and staring at people around you. Just be Yourself. 5. They have few different temperature of onsen, cold water bath, and outdoor onsen too! Outdoor Onsen is the BEST, under the cold weather you dip into the hot onsen. Is like the best feeling in the world. 6. 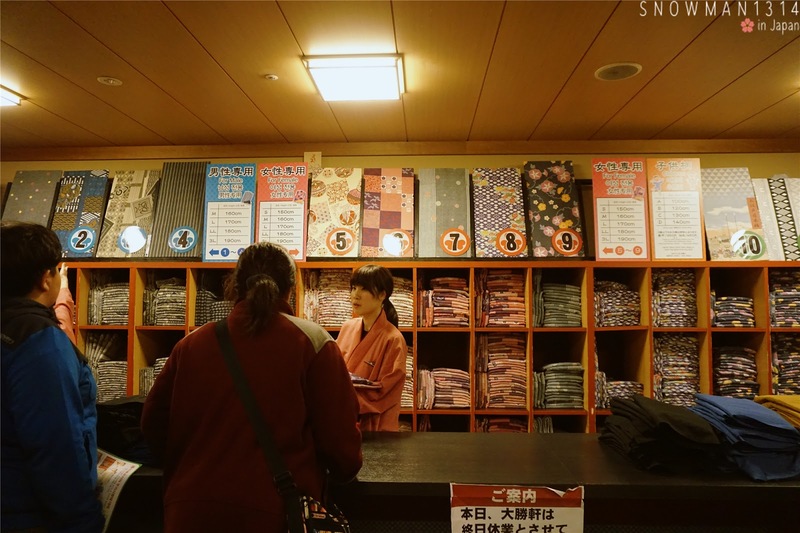 They did provide short towel for your hair, big towel for you to use after the onsen. Hair Dryer, Toothbrush, Face Toner, Hair Care products everything is in a corner where you can use. Everyday they have different deals for Man, Women, even elderly too! 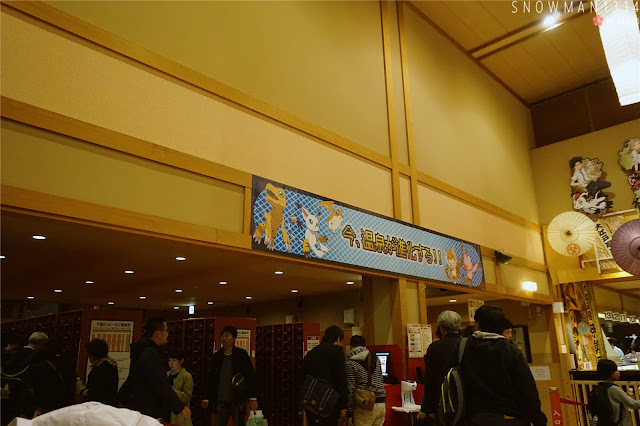 I manage to be in the public onsen for total of 20-30 minutes. 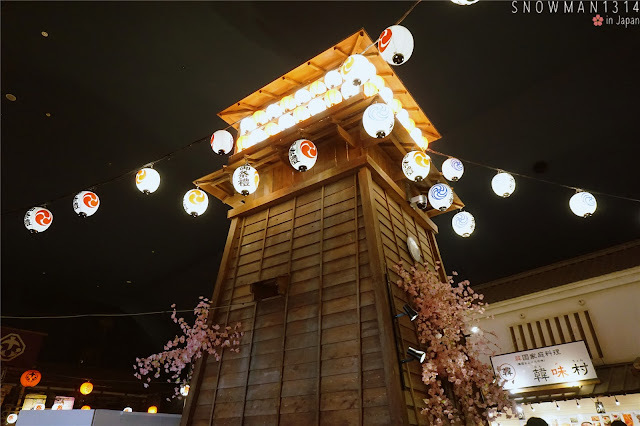 I can't soaked into the hot-spring for too long hour, I will feel dizzy and I didn't have dinner before I went to hot-spring too. 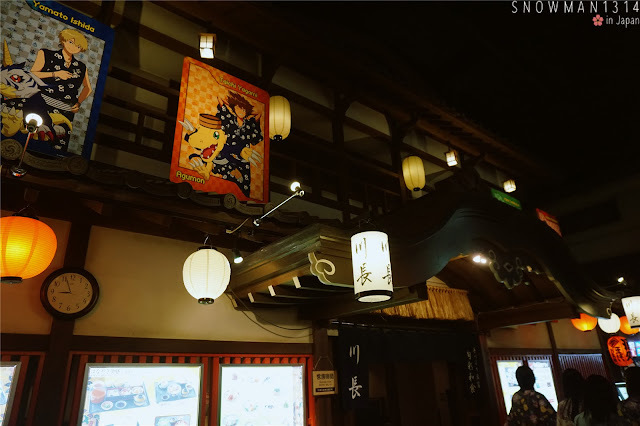 My boy has really enjoy himself in the onsen, he spend almost 1 hour inside. 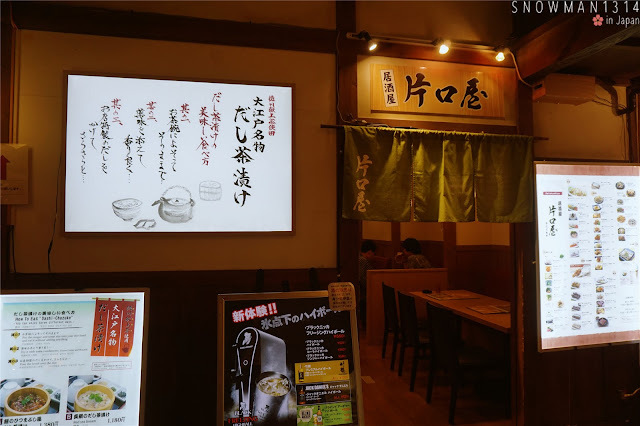 I'm feeling hungry too after the onsen. 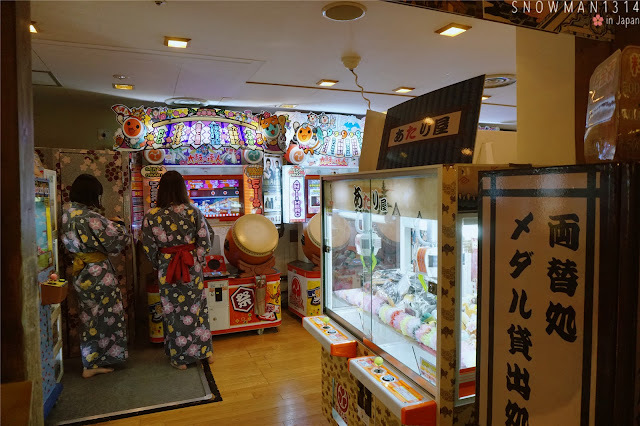 Inside Ooedo-Onsen Monogatari, more game stations for you to play while waiting and chilling. 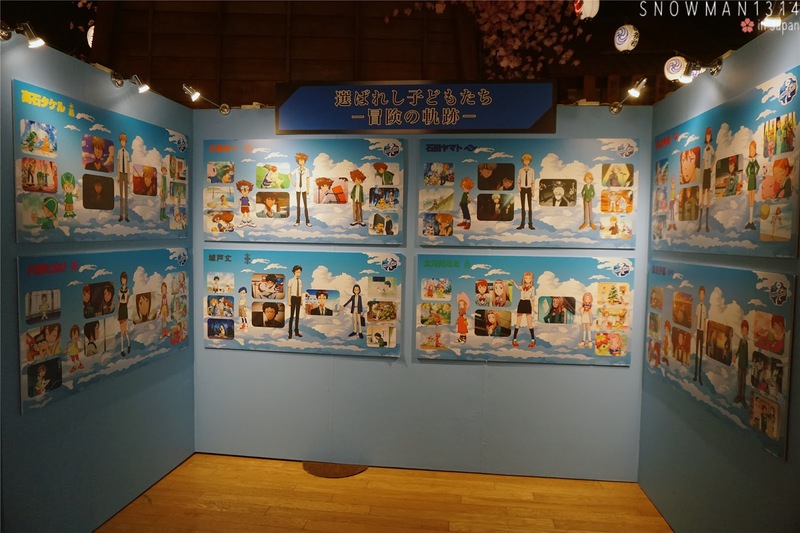 The prize from some of the game stations was actually small merchandise from Tri. Digimon! Feeling a little regret for not participate in all these game. 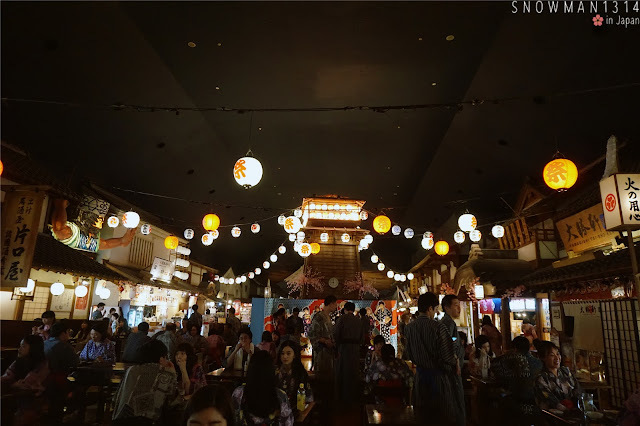 Walking through the game station, you will find yourself walk into another food court. More food varieties for you to choose. The crowds are really crowded when the night is getting late. I was so tired and keep on walking around. 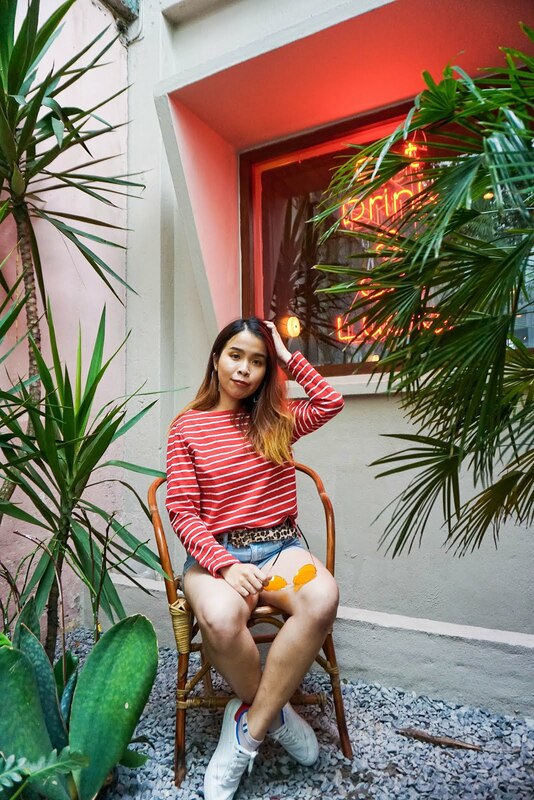 Don't feel like sitting alone with all the crowds. Manage to find a place to sit and dinner after walking and waiting for around 30 minutes. 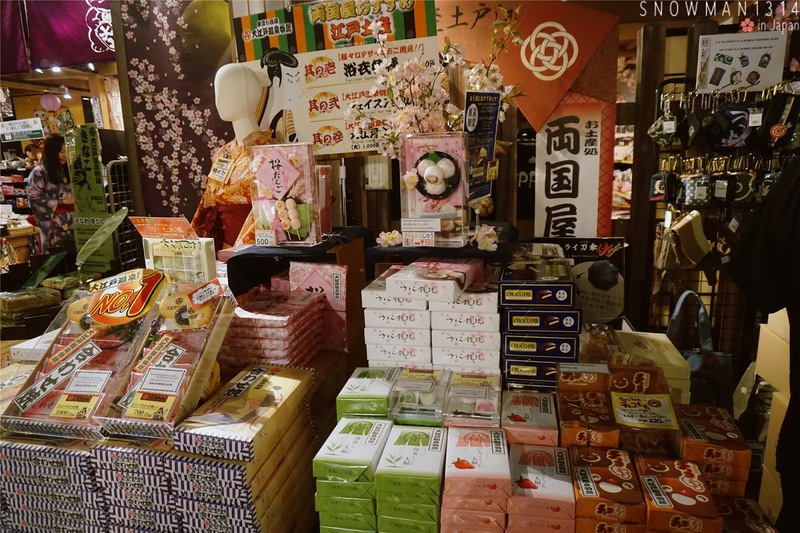 Merchandise where you can buy and get from Ooedo-Onsen Monogatari. Well we didn't buy any merchandise which we felt that it was quite pricey. 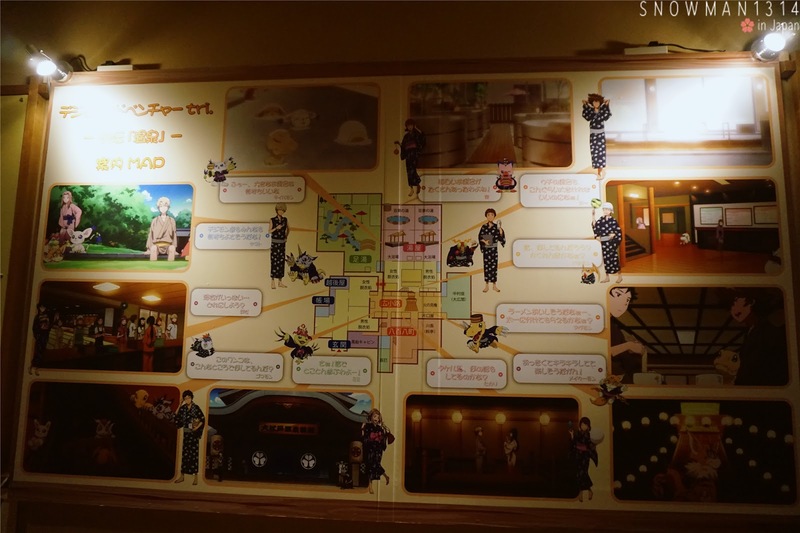 Some extra info when you going to Ooedo-Onsen Monogatari. You can spend your night here and it opens 24 hour per day. They did provide rooms for you to stay overnight. Everyday they have different deals and discount for Man, Woman and even elderly. You can choose which day is the cheapest for certain age group too! 1. Please note that each of the game round required to pay. Eg. 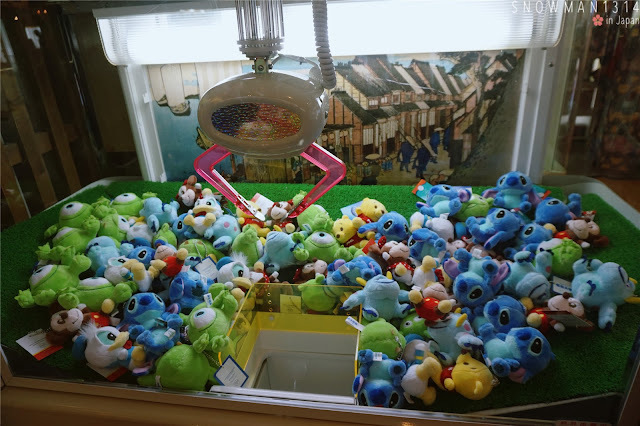 500 Yen for 3 Round. 2. 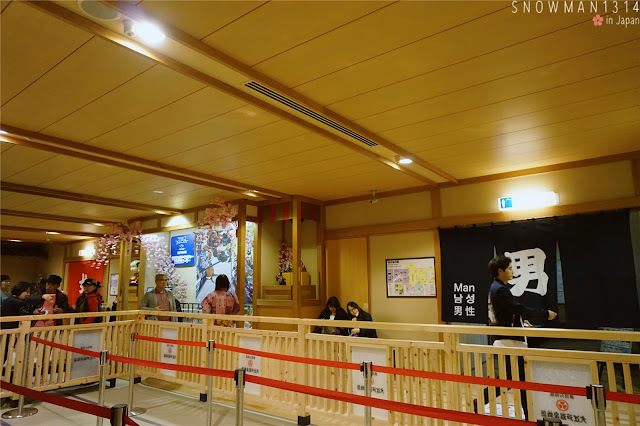 Extra payment when you spend inside Ooedo-Onsen Monogatari will be tagged in your hand-tag. 3. The payment you spend inside will be calculate when you exit from Ooedo-Onsen Monogatari. 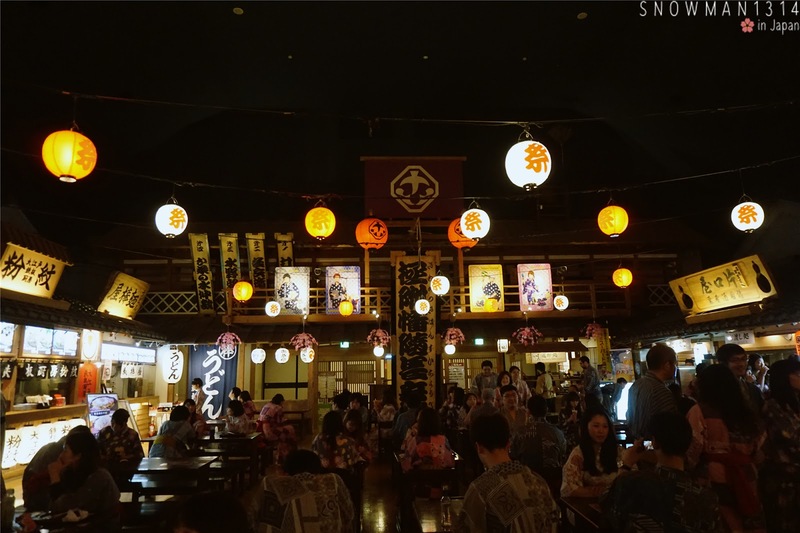 We didn't do anything much inside Ooedo-Onsen Monogatari except trying the Foot Spa, Public Onsen and Had our dinner there. So the payment will be charged only on the entrance fee for Adults and food we had inside too. For more info you can always check on their website. I absolutely love Japan! Its such an amazing place culturally. 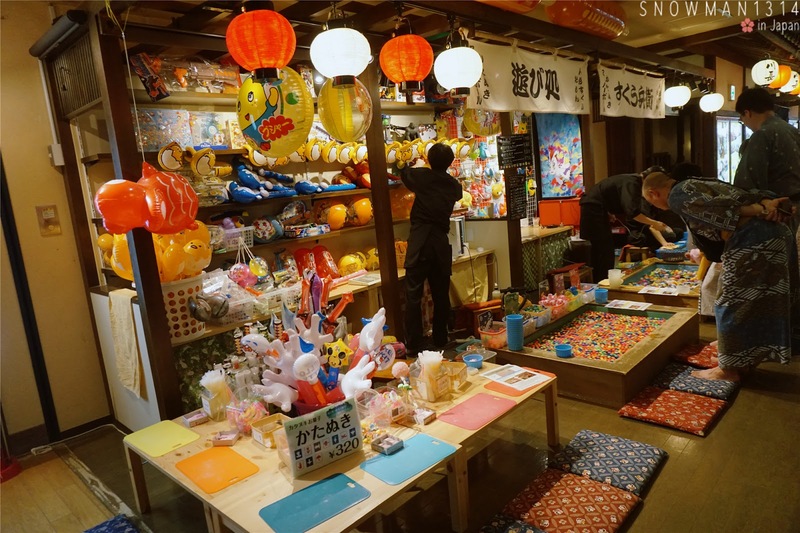 Ooedo-Onsen Monogatari feels like a fun fair city. Hope you're enjoying yourself. What was the cost like for 2 people? You can check on the price list! 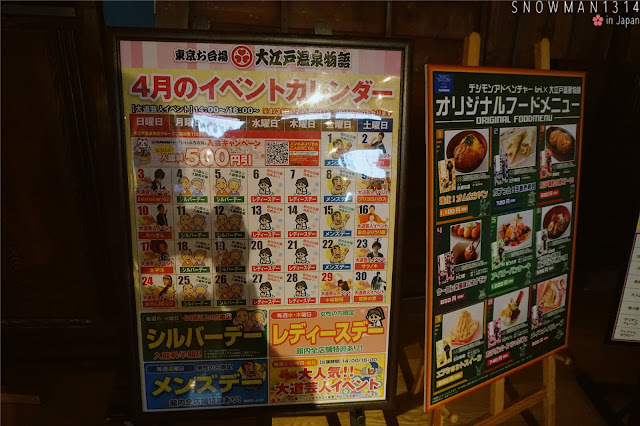 2072 Yen for 1 Adult =D This is just entrance fee! such a great country to visit. shall plan on next vacation with my dear. 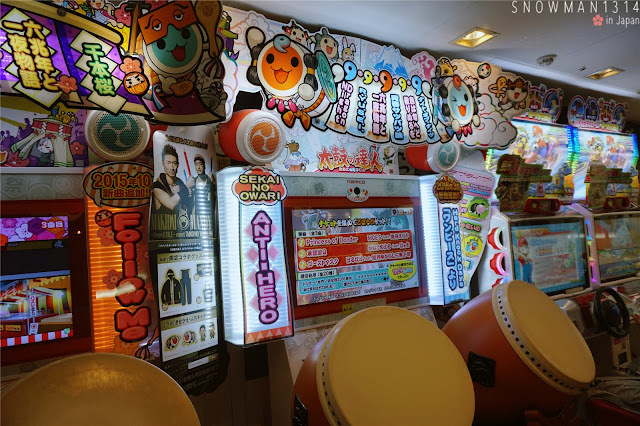 I wanna go back to Japan again.. this is such a fun-filled nice place! I want to go back Japan too! 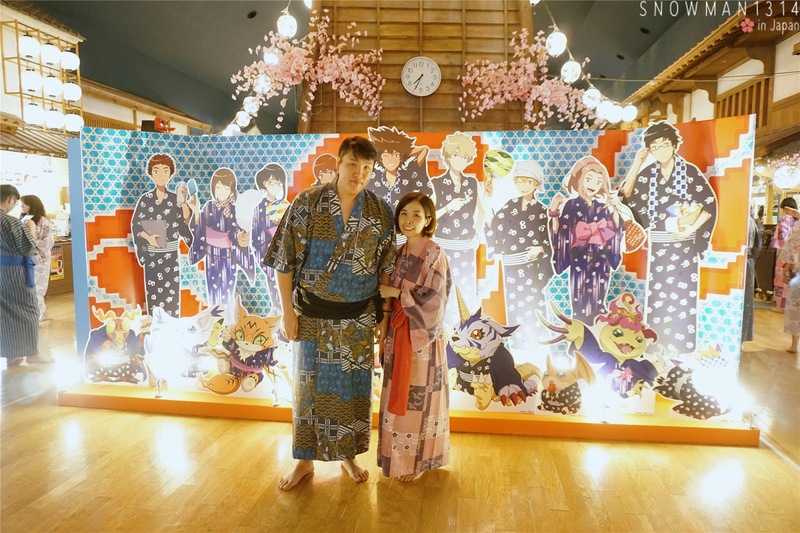 Really enjoyed your onsen experience and thanks for sharing all those tips. 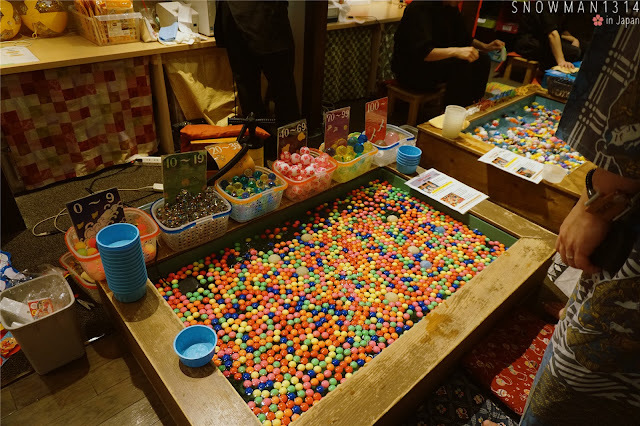 Would love to try it one day. No worries =D Yes it was a really fun experience! u make me missing japan d ><! 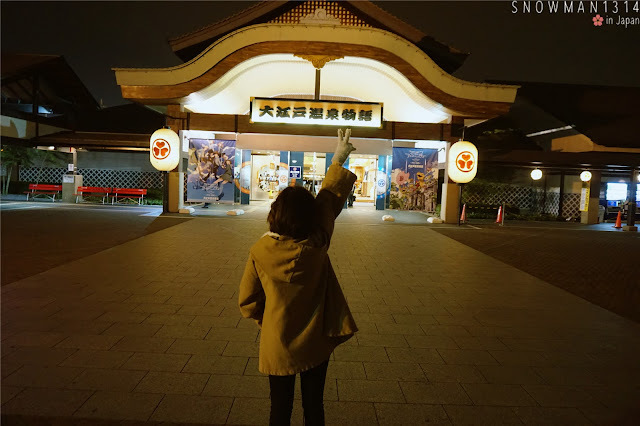 wanna visit this place next time! 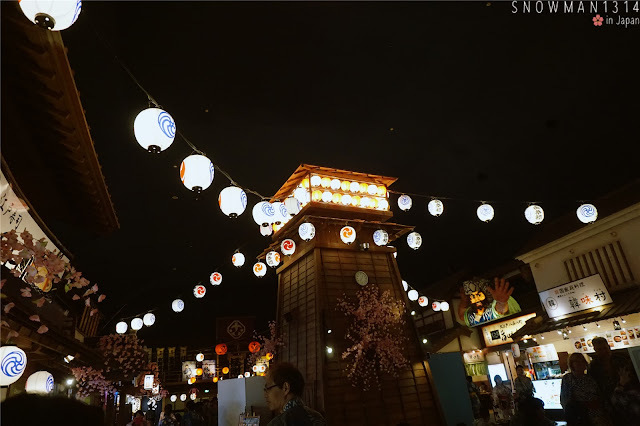 when you go some place like Japan, take as many photos as possible! that's what i would have done as well. Japan is absolutely beautiful dear. The photographs taken are great as well; im certainly missing the vibe here on my end.